November Greetings from Carte Fini! We're once again delighted and thrilled to welcome back Ms. Tiffanie Turner of papel SF for more lauded creations in this month's Featured Artist program! As the season turns to holiday and all things festive we welcome Tiffanie's artistry with welcome arms and excitement. We hope you're as inspired as we are! Hi there! I'm back to show you one of my most favorite projects I've ever come up with. 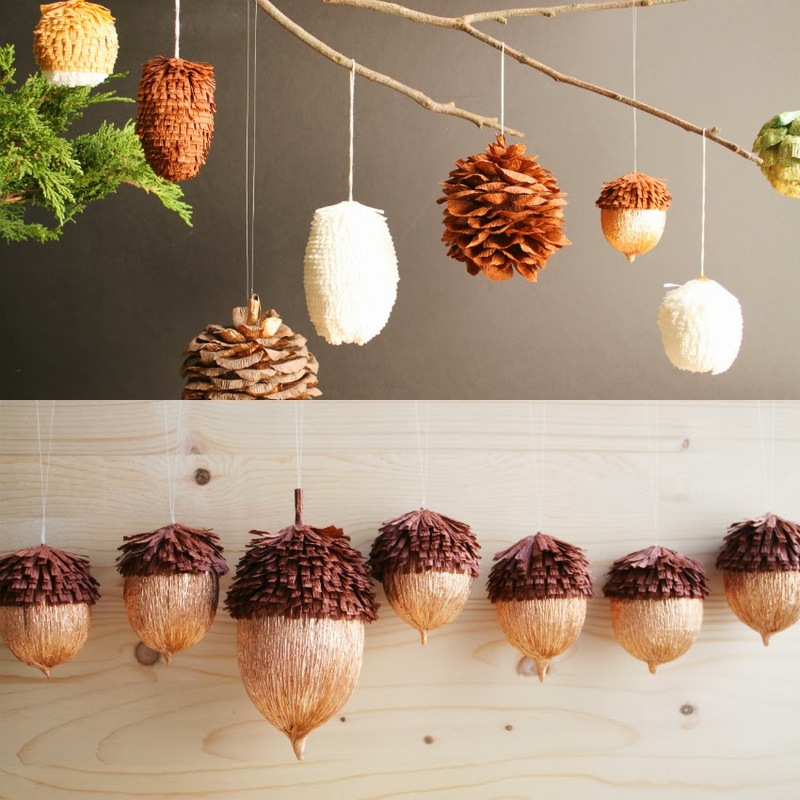 These woodland ornaments use blown out chicken or goose eggs as a base. They are fairly simple to make and look so beautiful hanging on a tree or mantle or holiday garland. There are so many different ways to change the palette on these ornaments, from classic natural browns and coppers to simple monochromatic pieces and everything in between. I had a lot of fun making these, and I hope you do, too. Let's get started. Carte Fini 180 gram floral crepe papers in colors of your choice. I used bi-color 808/6 (metallic copper/brown) for the bodies of the copper acorns, color 568 (saddle) for the acorn tops and pine cone seed scales, super fun color 801/2 (green gold metallic nuance) for a fresh green acorn with color 600/5 (seaweed nuance) as its cap, and colors 600 (bright white) and 603 (cream) for some monochromatic, porcelain-looking acorns. There are so many other combinations I can't wait to try, but we'll work with these colors for now! 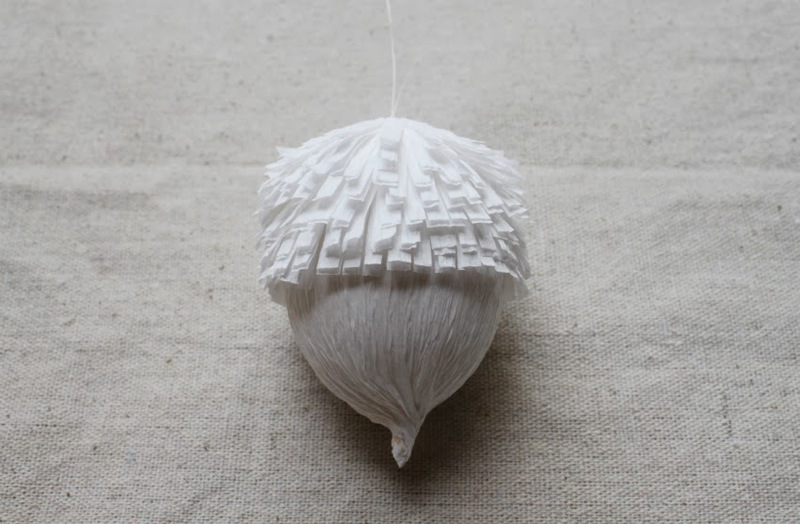 For any of the ornaments, start by attaching a clear monofilament cord to the top of a blown out egg. I use a segment of cord about 10" long and double it over into a loop about 5" long. Break off a piece of toothpick about 3/8" long and add a drop of hot glue. Carefully set the pair of cut ends of the cord into that drop of hot glue and then wrap the cord around the toothpick two or three times. When cool enough, squeeze it all together so it is fairly compact against the toothpick. Gently press the toothpick piece into the hole at the top of your egg. 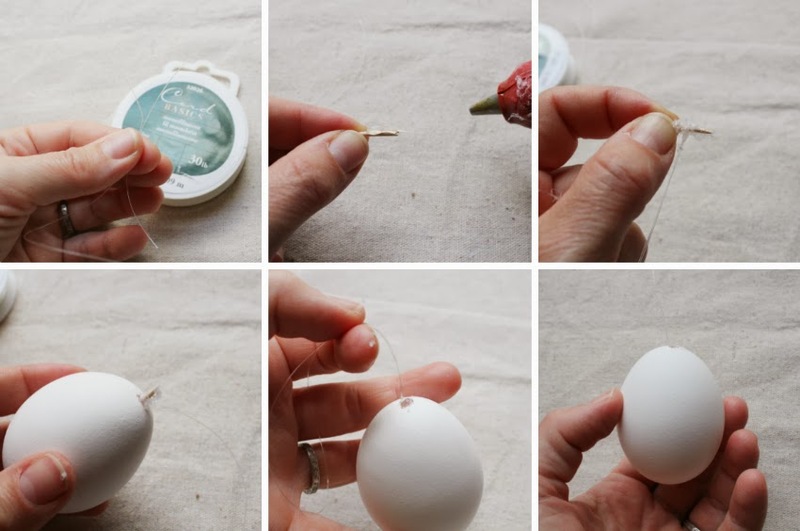 If the initial hole created to blow out the egg is not big enough, use a push pin to chip away at it until it is about 3/16-1/8" in diameter. Make sure at least a little bit of it is centered in the top of the egg, so that your cord will end up centered. After the toothpick is in the egg, add a drop of hot glue at the hole to secure the cord into place. 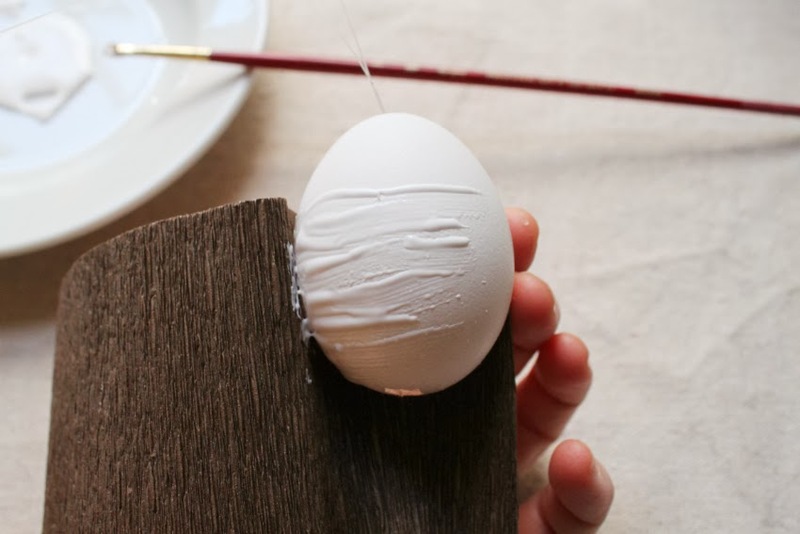 Be careful because the heat will start to melt the glue around the toothpick and the cord will start to pull out of the egg if you just let it dangle, so hold the cord up while the glue is cooling and try not to pull on it. 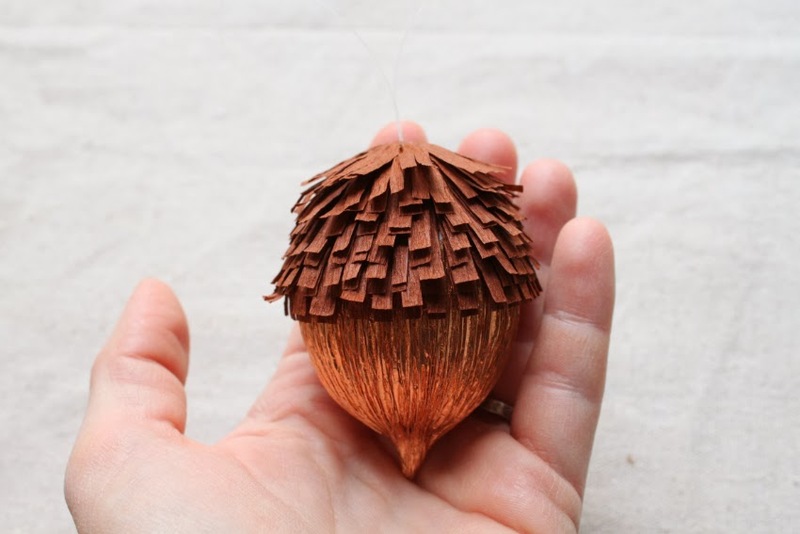 To create an acorn, cut a strip of copper paper about 6" long by 2 3/4" tall. 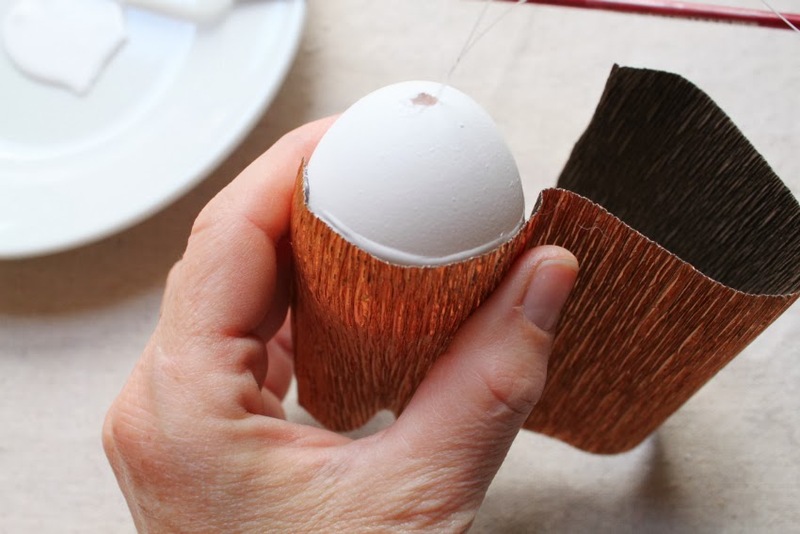 Secure the paper with the copper side out as shown to the side of the egg with a thin skim of hot glue. Not too thick or it will interrupt the smooth surface you will be creating on the acorn. 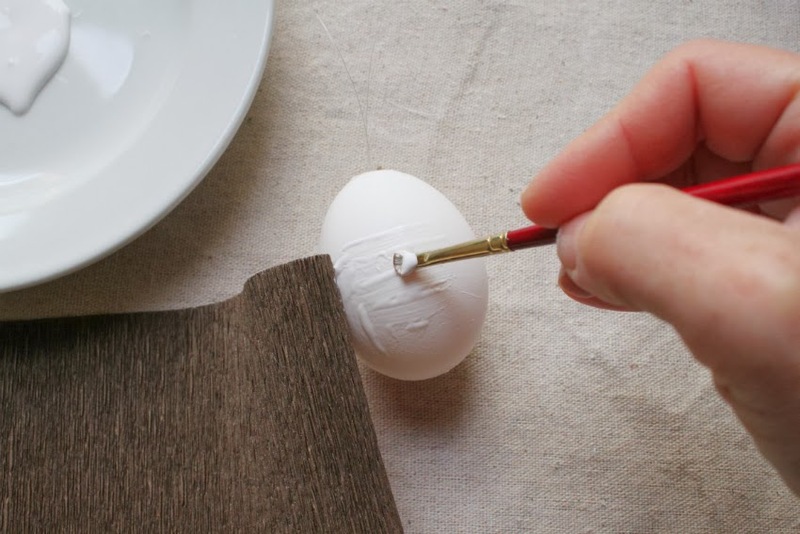 Apply tacky glue around the first third of the egg as shown below with a paintbrush. 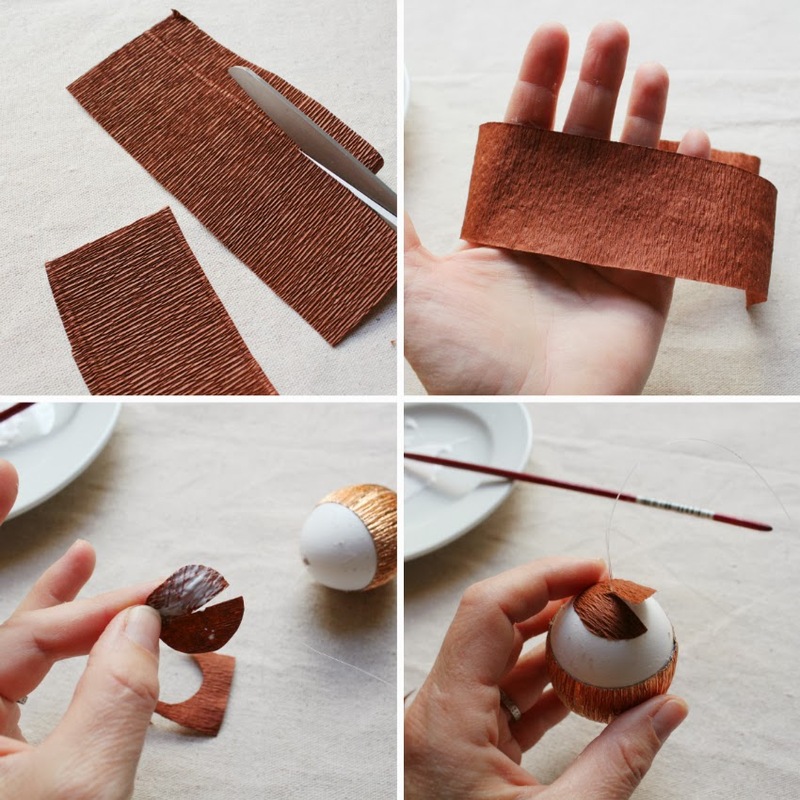 Gently pull the copper paper around to secure it to the egg. It can stretch just a bit. You are not looking to smooth out the creases in the crepe, you just want to give it a little bit of tension. 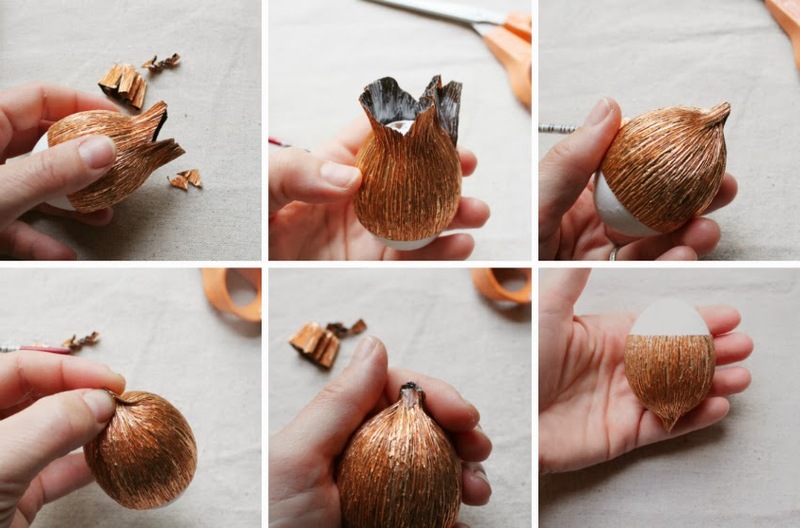 Keep working your way around the egg with the tacky glue and copper paper until you cover the entire egg. Trim the paper so that the end will overlap the beginning just a hair. Glue that end down, smoothing the seam gently with your finger. 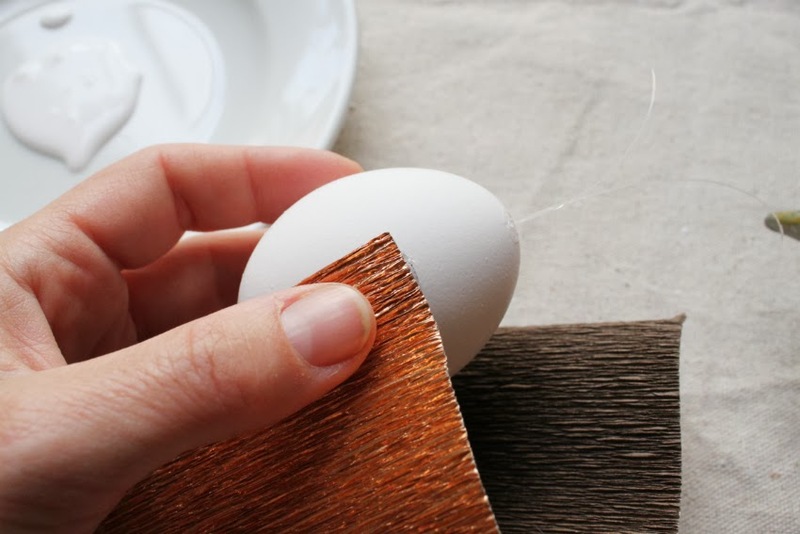 Add more glue underneath the top edge of the paper as needed with your paintbrush, and gently press the top edge of the paper so it is right up against the egg. Hold down until set. Now for the bottom. 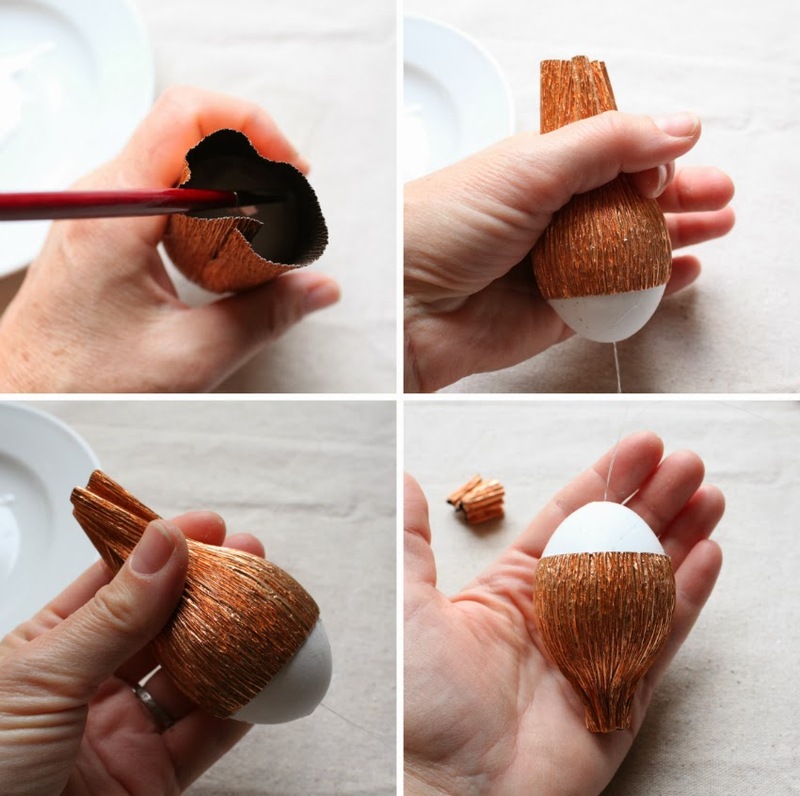 Using your paintbrush, cover the remainder of the bottom of the egg (within the paper) with tacky glue. Softly press the paper down so it adheres to all but the very bottom of the egg. Trim the paper at the end so that there is about a half inch or a little less left at the bottom. Next cut two triangles from the excess paper at the bottom of the egg, on two opposite sides as shown in the first photo below. Apply tacky glue to the interior face of the excess paper and the very end of the egg for good measure. Press the two shorter sides from which the triangles were cut down onto the surface of the egg, then press together the two longer sides, gathering as needed to make sure no egg is exposed. This takes some practice, but also know if you end up with any gaps you can come back and patch the holes with extra paper. The metallics blend fairly seamlessly. As shown in the second row of photos below, prepare the tip of your acorn by tucking and pressing one side into the other and giving it a test twist to see how it will look. Add glue to the part that will be covered when you twist the end, and twist the end gently but firmly to create the tip of your acorn. Now you can move on to the cap! You will notice on the solid colored crepe paper that there are grooves in the paper every 1 3/4" or so. Use these as a guide and cut a few 8" long strips of the brown (saddle) colored paper between the grooves. Stretch those pieces out gently and then rub up and down on the square edge of a counter while holding outstretched. Cut a nickel-sized circle out of the stretched paper and then cut one radial slit to the center. 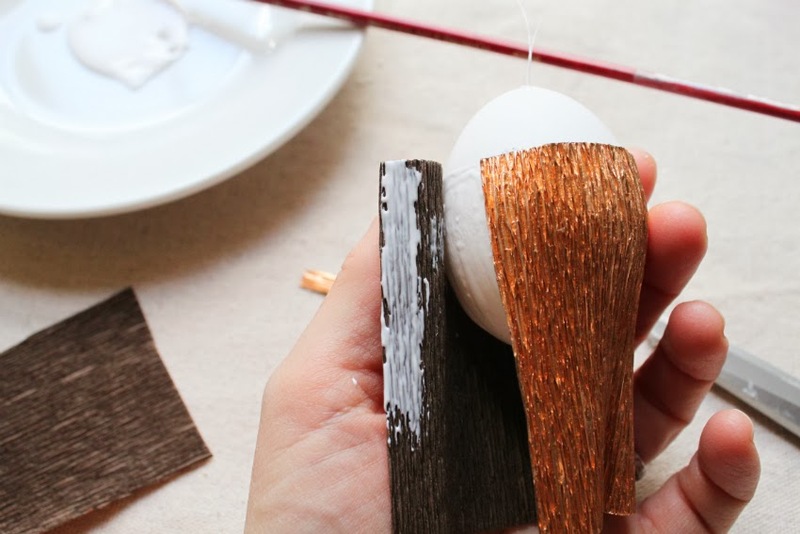 Apply tacky glue to one side and then glue to the top of the egg, working around the monofilament hanger as shown below. 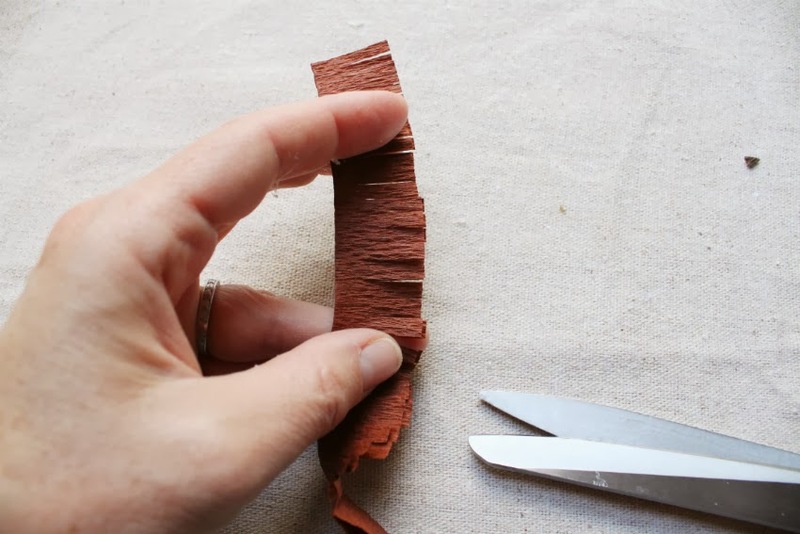 To create the fringe you will use for the cap, fold a length of stretched crepe paper the long way, then cut slits every 1/8" +/- about about two thirds of the depth of the folded paper. I usually cut my fringe as I go, working with as short of lengths as I can to keep control of the paper. When you are ready, paint a line of tacky glue along the back side of a piece of fringe, along the part that hasn't been slit. Examine your acorn to see how far down you would like the cap to come (I like it when the cap is almost halfway down the acorn) and attach one end of the fringe to the egg as shown. This next part takes a steady hand and a good eye. 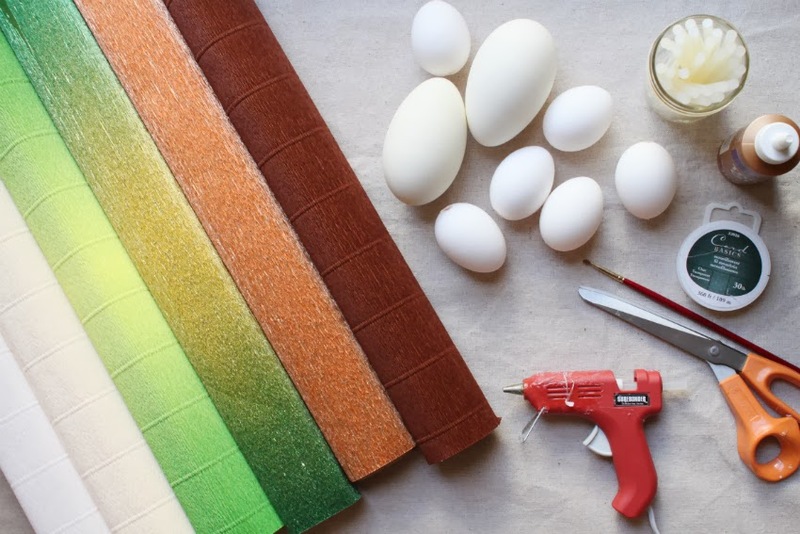 Glue the bottom row of fringe down to the egg slowly and firmly, checking frequently to make sure you are taking it in a straight line around the egg. Overlap the end of the fringe over the beginning by about 1/4" and glue down. 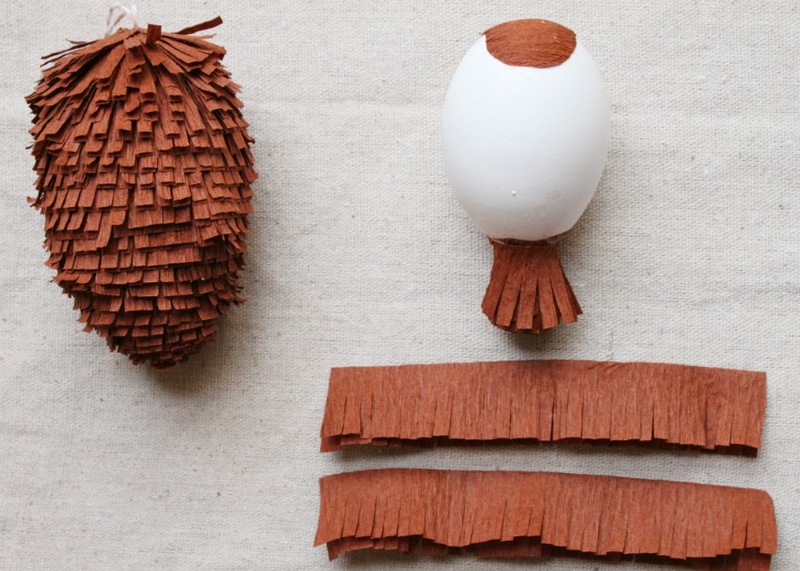 Apply glue to the back of a new section of fringe and apply that fringe around the egg about 1/8" above the first layer. Repeat until you've got a top layer of fringe wrapping right around the base of the hanging cord. 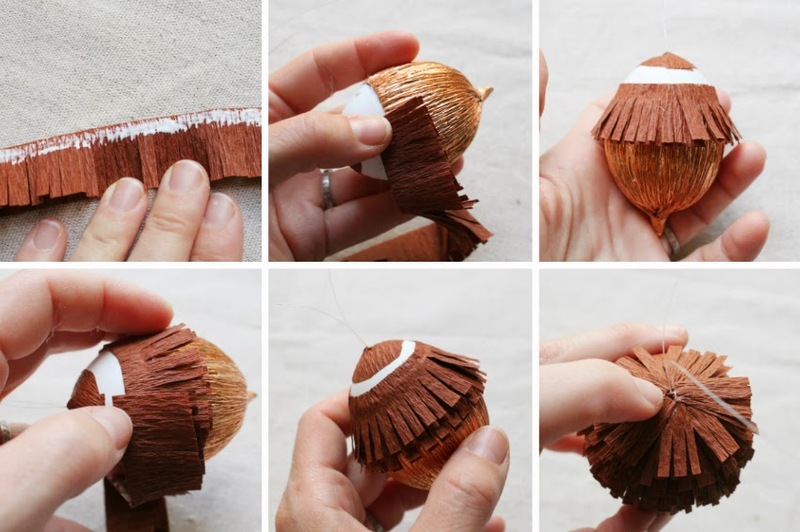 Carefully dab in little beads of tacky glue as needed and press down occasionally on the top layer of fringe until the glue has set and the top of the acorn fringe is well secured and not popping up all willy-nilly. There you have it. 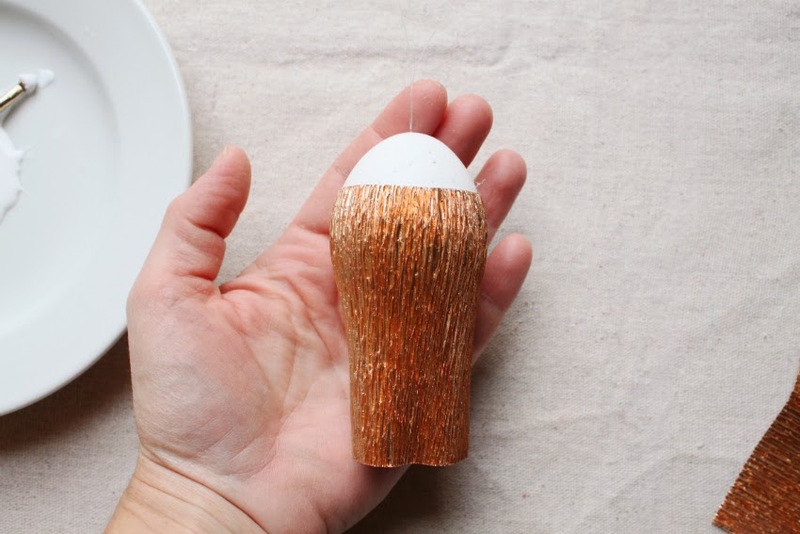 An adorable, shiny, magical little acorn made from a chicken egg, of all things! I love this one I made with the green gold metallic and seaweed nuance papers (801/2 and 600/5). I'm going to make a lot more of these. We call it the "Tinkerbell acorn". And here's an example of what you can do in all white. This would be fun to do with many of the other matte colors. I intend on proposing a line of monochromatic and multicolored spring acorns to One Kings Lane early next year. Currently I am preparing inventory to sell the copper acorns through them in mid-November! 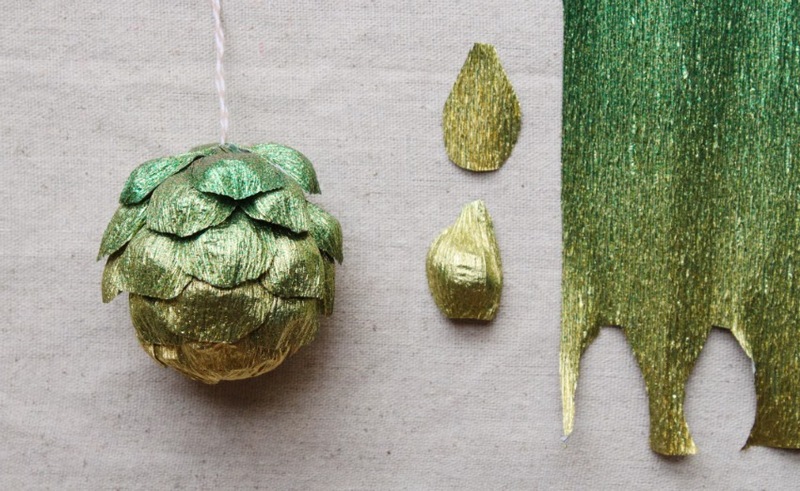 Use the metallic green gold to make a sort of festive artichoke-type ornament. Take advantage of the ombré effect of this fantastic paper and cut petal shapes in different gradients from gold to green. Stretch the petal shapes so they are quite cupped and glue the bases of the petals (leaves, really) to an egg, starting at the bottom of the egg and moving upward in an staggered overlapping pattern as shown. This one is one of the most eye-catching-est pieces I've made in this series. People are really drawn to these colors! 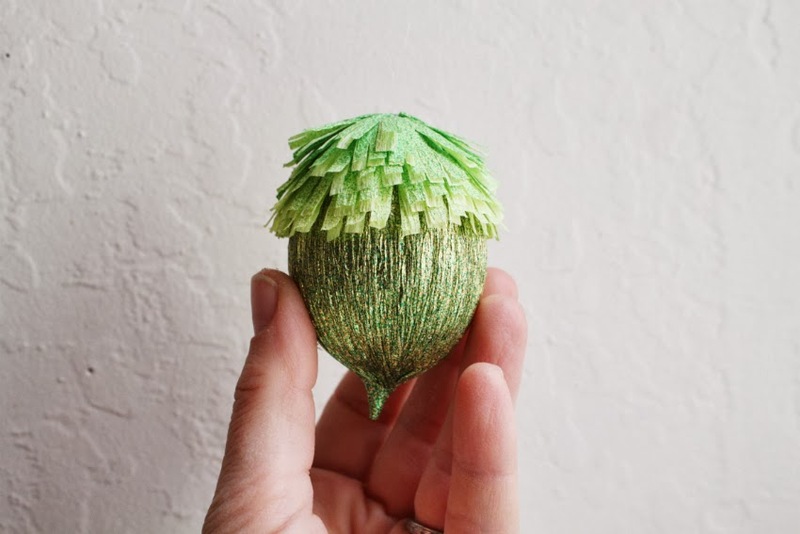 To make this basic pine cone, roll a section of fringe onto itself and attach with hot glue to the bottom of an egg so it dangles as shown below. Then simply work your way up the egg with the fringe in the same manner you did to create the acorn cap and there you go. A pine cone! And finally, the more advanced pine cone. This piece took about six hours to finish so I won't get into the details here, but the seed scales are made from angled petal shapes that are cupped and then bent back at the ends. Pretty involved, but very pretty. I hope you have enjoyed this tutorial! I am honored to be able to share my ideas here on the Carte Fini website as the featured artist. I'll be back in December with another fun holiday project made with beautiful Carte Fini crepe paper. Have a happy Thanksgiving! Tiffanie will be teaching a free class on how to make these ornaments live online this Friday, November 8th at 9:00 a.m. through creativeLIVE. This tutorial should not be used for any commercial purpose. We appreciate your understanding. Thank you so much for this wonderful tutorial! I’m so happy to have found it. I’m ordering my paper today for acorns and just had a question. How do you make the large acorns regarding eggs? Do you just use more than one orr is it that the picture just makes that one look really large? If you cut out shapes like the one shown in the final photo of this post, you should be able to work your way down an egg and create a pinecone without too much trouble. 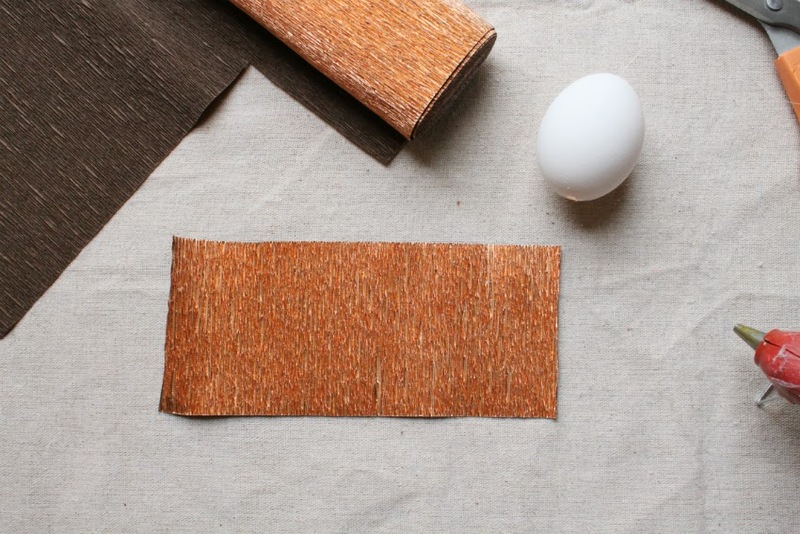 I have no instructions I can email you at this time, but it really is as simple as cutting and stretching the brown (sable) paper into seed pods as shown and glueing them to an egg wrapped in brown paper. I hope this helps a little bit. Good luck! Hi Tiffanie, I am dying to know how you did the pinecones that took 6 hours to make. I start making crafts with kids in my daycare in the early fall for Christmas and this has to be one of them that we make!! Please help :) If you can and have time, can you email me the instructions? I will try to figure it out without pictures if you don’t have any Thank you Tiffanie, you are amazing! !